Our 2018 goal? To help athletes work IN to get big results and achieve their goals. 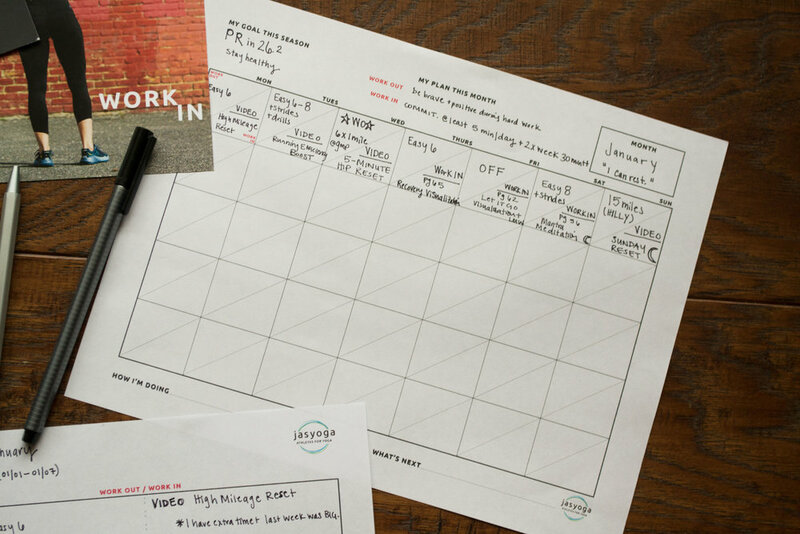 Not only is Work IN now available to give you the tools you need to recovery for real, we’ve also created the Athletes for Yoga Training Plan: a new, easy-to-use monthly + weekly planner to help you optimize your training and find the right balance of working out AND working IN. Use this plan to help you ground how to use meditation and restorative yoga to help you achieve your goals, practice strategically, and track your progress. We’ll be sharing how the pros plan their workouts AND work INs throughout the coming months, including how they use Jasyoga Video and Work IN book. Athletes need you to lead by example, too, and we can't wait to follow your journey in the year ahead. Share with #athletesforyoga! Bonus: new Jasyoga Video subscribers use code WORKIN by January 10th for a free month of Jasyoga Video to help you get started. Embracing recovery will make you a better athlete. Your body is asking you to work IN. It's time to listen and respond. Let’s go!